Developments in diamond coatings allow tools to work harder, last longer. Diamond coatings, applied by the chemical vapor deposition (CVD) process, have unmatched advantages when applied to tungsten carbide cutting tools. Chemical vapor deposition diamond retains the properties of natural diamond. Its ultra-high hardness and elastic modulus result in exceptional dimensional stability and resistance to abrasive wear. Like natural diamond, CVD diamond has a low coefficient of friction that results in low cutting forces and low power consumption, low frictional heating and resistance to built-up-edge when cutting. These corrosion-resistant coatings have long lives when they are used to cut corrosive polymers such as the phenolic resins used in composite materials, and they are resistant to the corrosive damage of cutting fluids. Diamond-coated tools excel at machining abrasive nonmetallic materials, nonferrous metals and abrasive nonferrous metals. However, the chemical instability that arises with diamond and metal alloys containing iron, nickel or cobalt limits its use in cutting ferrous alloys and superalloys. A number of coatings are referred to as diamond, but chemical vapor deposition diamond is the only coating that uses 100 percent real diamond crystals. Diamond is composed of pure carbon atoms, arranged in a special crystal orientation that gives it its unique physical properties. At 9,000 Vickers to 10,000 Vickers, crystalline diamond is nearly twice as hard as amorphous, diamond-like coatings (DLC). Amorphous diamond, or diamond-like coatings, are carbon films that are applied with a physical-vapor-deposition (PVD) process. These films are not as thick as diamond films that are made with the chemical vapor deposition process. They do not have a crystalline structure, and they typically have about 10 percent to 15 percent the life of chemical vapor deposition diamond-coated tools. Unlike metal-sintered polycrystalline diamond (PCD) that applies a diamond tip to tooling, chemical vapor deposition crystalline diamond coating enables the entire tool surface, including tools with complex geometries, to be protected with the super hard material. Being able to coat such unique geometries provides a significant advantage over polycrystalline diamond tools, which are expensive to grind. Physical-vapor-deposition coatings with metal-nitride compositions, such as titanium aluminum nitride (TiAlN), have only one-third the microhardness of crystalline diamond. The advantages of a chemical vapor deposition diamond-coated drill over a polycrystalline diamond-tipped drill were illustrated in a carbon-fiber drilling application that reduced per-hole cost by up to 70 percent. The chemical vapor deposition, diamond drill produced 300 through holes in the composite before burrs and delamination occurred, compared with 150 holes produced by a PCD-tipped drill. Crystalline diamond is grown in a hotfilament chemical vapor deposition process that can take from 20 hours to 40 hours. The 1,500 F (815.5 C) temperatures used in the process preclude anything but solid carbide from being coated, and the meticulous pretreatment process requires 6 percent grades of carbide for the best adhesion. Without pretreatment, diamond has almost no chemical bond to cemented carbide. However, diamond can grow into a roughened carbide surface and attach itself through the mechanical interlocking of the carbide and diamond. Tools with 10 percent cobalt content can be coated, but additional processing to achieve good adhesion makes this more expensive. While companies are working hard to increase deposition rates and develop new pretreatments, important advancements have been made to the coating itself. The life of diamond-coated tools depends on the material being cut, the cutting speeds and feeds, and the part geometry. As a rule, graphite diamond-coated tools last 10 times to 20 times longer than bare tungsten carbide tools. This allows for lights-out-operation, and jobs can be machined completely with one tool. Wear and the need to recalibrate tools is reduced. In composite materials, it is not unusual to get longer life. With high-density fiberglass, carbon fiber and G10-FR4, diamond-coated-tool lives of 70 times that of bare carbide have been reported. Because of the long time required to coat tools with diamond, and the pretreatment procedures required to achieve good adhesion, diamond-coated tools are expensive. Although diamond-coated tools cost about five times as much as good quality carbide tools, they can dramatically reduce overall cost of production because of their broad operating range and long life. For example, one automotive manufacturer machining high-density fiberglass raised productivity from 15 parts per standard $15 end mill to more than 750 parts with a $150 diamond-coated end mill. That saved the company more than $600,000 annually. As aerospace manufacturers increasingly make use of composite materials, engineers are learning that a combination of diamond coating and application-specific tool geometry provides the most efficient machining solution. Composite materials such as high-density fiberglass, carbon fiber and G10-FR4 are very abrasive. Without proper pretreatment for the cutting tool, the abrasiveness of these materials can lead to poor adhesion of the diamond film to the carbide. 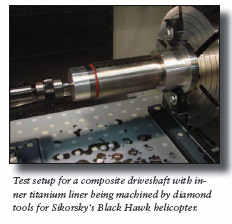 In one aerospace application, the National Center for Defense Manufacturing and Machining (NCDMM) and Diamond Tool Coating LLC provided a one-tool answer to machine a driveshaft composed of an inner titanium liner, an IM7 carbonfiber tube and an outer titanium end fitting for Sikorsky’s Black Hawk helicopter. The diamond coated tool created quality holes at a fraction of the cost of their PCD-tool counterparts. In another application, the NCDMM and Diamond Tool Coating developed diamond tooling to machine high-precision targeting systems from Lockheed Martin Missiles and Fire Control. Lockheed was having difficulty achieving accuracy because of excessive tool wear in the abrasive application. Where other coatings flaked off, chemical vapor deposition diamond significantly increased tool life and part quality.